Low-cost health screenings and wellness activities—think yoga, diabetes education, childbirth classes, strength training and support groups—are provided in the heart of downtown Charlevoix thanks to the Munson Healthcare Charlevoix Hospital Wellness Workshop. The workshop encourages people of all ages to participate in health and wellness activities, such as cooking classes! Amanda Evans, MS, RD, CDE is a Registered Dietitian at Charlevoix Hospital and the Wellness Workshop. And when it comes to cooking, she knows the importance of adding vegetables to your meals—even for the pickiest of eaters. From sneaking vegetables in sauces to blending them into your breakfast and burger routines, Amanda shares her top tips on how to eat more vegetables. Make “fries.” The obvious white potato and sweet potato are good options but consider turnips, parsnips, beets and various types of squash. A drizzle of olive oil and a light sprinkle of salt or your favorite seasoning makes the flavors come to life. Include vegetables with breakfast. Try options such as omelets, frittatas or egg skillets and add peppers, tomatoes, onions, spinach, mushrooms—whatever veggies you like. Add vegetables to sauces such as marinara for pasta dishes. Experiment with various vegetables. If chunky sauce is not appealing, try pureeing vegetables to mix into the sauce. Replace pasta and rice dishes with zucchini noodles or riced cauliflower-based dishes. Eating zucchini noodles will never be the same as eating pasta noodles—change it up a bit. Instead of making spaghetti and using a red marinara sauce, I sauté the zucchini noodles and add various vegetables, including diced tomatoes. Seek out muffin/bread recipes that specifically call for fruits and veggies. My family likes banana zucchini oatmeal muffins, sweet potato muffins, baked blueberry oatmeal cups and even pumpkin pie quinoa breakfast cookies. You can also do this with pancakes, waffles and so much more. Don’t overlook “bites” made with various fruits, vegetables, grains and nut butters as a way to sneak in a quick, healthy breakfast or snack. Add vegetables to “burgers.” If you are not wild about veggie burgers, use ground beef, turkey or chicken and add in your choice of diced vegetables such as mushrooms, spinach or colorful bell peppers. If this does not appeal to you, try adding pureed carrots or sweet potato instead of diced. Need a quick lunch (or breakfast or dinner)? Try wrapping fruit in a whole wheat tortilla with a little bit of nut butter. My personal favorite is a sliced apple with natural peanut butter and cinnamon. My kids enjoy banana and peanut butter. Of course, you can always make a veggie wrap with bell peppers, onions, spinach and more. Always add more vegetables than the original recipe calls for! Be it soup, chili, homemade pizza, casseroles—I always add more vegetables. Learn more about Munson Healthcare Charlevoix Hospital’s Wellness Workshop. 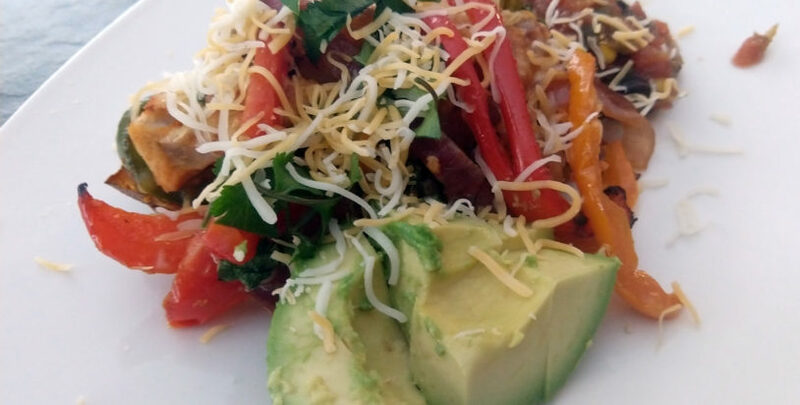 Amanda Evans, MS, RD, CDE shares one of her favorite veggie-packed dishes. Try making these affordable and tasty twice-baked chicken fajita sweet potatoes at home. Wrap sweet potatoes in one piece of paper towel. Microwave on high for 10 minutes. Remove carefully from microwave and unwrap (be careful of the steam that will escape from inside the paper towels). Pierce all over with a fork, wrap again and microwave for 14–15 more minutes until soft (if the centers are still a little hard, don’t worry they will continue to cook in the oven later). Preheat oven to 430°F. Spray a baking tray/sheet with nonstick spray and arrange sweet potatoes. Roast for one hour in the oven or until soft (check them after 40 minutes, pierce with a fork and continue roasting if needed). While the sweet potatoes are cooking, add a small amount of oil to the frying pan. Cook the onions on the a skillet/frying pan over medium-high heat. Once transparent (about 1–2 minutes), add the chicken, garlic and bell peppers. Cook until the garlic is fragrant. Add in the seasonings and continue cooking until chicken is completely coated. Mix the beans through; take off heat and set aside. Remove the sweet potatoes from the oven; allow them to cool for about 5 minutes until they are just warm enough to handle (not until they’re completely cold); and carefully slice them in half. Slice around the inside of the skin, leaving a 1cm “wall” around the inside of the skin. Slice small cubes into the flesh for easier removal. Scoop out the “flesh” and transfer it into a medium-sized mixing bowl. Set the skins aside. Add the chicken fajita mixture to the sweet potato in the bowl; mix it through until completely combined. Stir in the lime juice. Arrange the skins on the same baking tray/sheet, and stuff them with the fajita sweet potato mixture. Sprinkle with cheese and the coriander/cilantro leaves (optional). Put them back into the oven for 15–20 minutes until cheese is bubbling and starting to brown (or place under the grill/broiler in the oven for 10 minutes for golden, crispy cheese). Serve with any leftover coriander/cilantro leaves, lime wedges, avocado pieces and smother in salsa.